Gifts from the Pirates: "Write it on your heart that every day is the best day in the year." "Can we stay up till midnight tonight please?" is not something that we hear a lot but when it comes to new years eve it is used regularly. There is no way the boys would hack staying up till midnight without being like a pair of miserable zombies the following day. So every year we deceive them by using the London firework display on Youtube from the previous year. I'm sure we are not the only family that pull out some craftyness on the final day of the year. This year though thanks to Netflix we didn't need to use the fireworks display as they had come up with a genius way to see in the new year at any time of the evening so as we all relaxed watching the TV we counted down the hours approaching (Ahem) midnight. This year we saw the first new year in with Mr. Peabody and Sherman with a special Netflix countdown helping us parents dupe our little ones into thinking they have made it all the way to 12, genius. With 6 different characters to choose from including Care bears, Puffin Rock and Inspector Gadget. 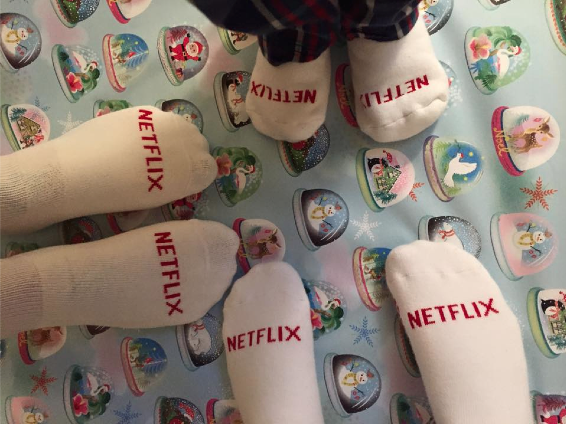 The Netflix new years countdown was a great addition to out celebrations. And with the little ones tucked up with smiles on their faces it gave me and Mrs M the chance to relax. We were planning on being in bed before 12 but we received a facetime call from our friends Sam and Jamie from South America and we stayed on the phone for 2 hours. We opened wine and ate Nachos, it was like being out to dinner together. A pretty perfect end to a pretty perfect year.